VATICAN CITY (CNS) — The Vatican has accused a former director of the Vatican bank and his lawyer of money laundering and embezzlement, saying the men skimmed an estimated 57 million euros (about $68 million) off profits from the sale of Vatican properties. 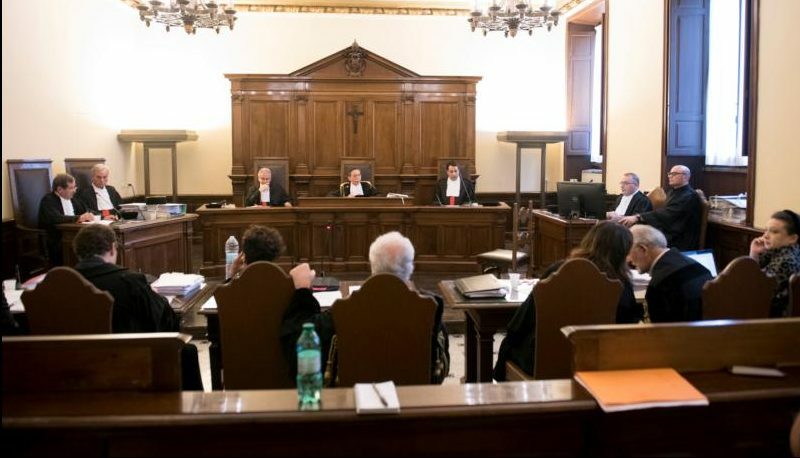 The trial of Angelo Caloia, who served as president of the Institute for the Works of Religion, the formal name of the bank, and his lawyer, Gabriele Liuzzo, began in the Vatican courtroom May 9. The Vatican had announced in late 2014 that the two men — along with Lelio Scaletti, the former director general of the bank — were under investigation in a case involving the sale of 29 Vatican-owned buildings in Rome and Milan between 2001 and 2008. Scaletti has since died. During the investigation, the Vatican had frozen a total of about 17 million euros ($20 million) in the Vatican bank accounts of the three men. At the opening of the trial May 9, Gian Piero Milano, the Vatican’s chief prosecutor, said that at the Vatican’s request, the Swiss government froze another 10 million euros ($11.8 million) in a Swiss account in Liuzzo’s name. The first session of the trial lasted almost four hours and included a formal reading of the charges, the presentation of the lists of witnesses expected to be called and the entry of procedural requests. While not setting a date for the next session, the court asked the defense team to submit a reduced list of witnesses by May 18; the initial list submitted by the defense included more than 50 witnesses, including many cardinals who were or are part of the council overseeing the bank. The court also agreed to a defense request for an official Italian translation of an English-language report of an audit the bank asked the U.S.- based Promontory Financial Group to conduct. The audit, performed at the request of the bank’s new leadership, prompted the Vatican’s criminal investigation into allegations that the accused sold Vatican property and officially reported a much lower sales price than they actually received, pocketing the difference. The Vatican court also agreed to a defense request for an independent audit of the properties involved.